An apartment building has five floors. Each floor has either one or two apartments. There are exactly eight apartments in the building. The residents of the building are J, K, L, M, N, O, P, and Q, who each live in a different apartment. J lives on a floor with two apartments. K lives on the floor directly above P.
The second floor is made up of only one apartment. M and N live on the same floor. O does not live on the same floor as Q.
L lives in the only apartment on her floor. Q does not live on the first or second floor. Q lives on the third floor. Q lives on the fifth floor. L does not live on the fourth floor. N does not live on the second floor. J lives on the first floor. K lives on the second floor. M lives on the first floor. N lives on the fourth floor. O lives on the third floor. P lives on the fifth floor. If J lives on the fourth floor and K lives on the fifth floor, which one of the following can be true? O lives on the first floor. Q lives on the fourth floor. N lives on the fifth floor. L lives on the fourth floor. P lives on the third floor. If O lives on the second floor, which one of the following CANNOT be true? K lives on the fourth floor. K lives on the fifth floor. L lives on the first floor. L lives on the third floor. If M lives on the fourth floor, which one of the following must be false? O lives on the fifth floor. L lives on the second floor. P lives on the first floor. If J lives on the fourth floor, then Q does not live on the fifth floor. If O lives on the second floor, then L does not live on the fourth floor. If N lives on the fourth floor, then K does not live on the second floor. If K lives on the third floor, then O does not live on the fifth floor. If P lives on the fourth floor, then M does not live on the third floor. If O lives on the fourth floor and P lives on the second floor, which one of the following must be true? M lives on the third floor. After conducting a thorough overview of this set, you’ll find our task once again is that of sequencing—this time, ordering eight people on five floors of an apartment building. The one small twist is that in order to fit the eight people, some floors must get more than one person. No problem: We’re told that each floor has one or two apartments, and that each person lives in a separate apartment. Mainly, we’ll be asked to put the entities in order based on which floor they live on. 1) Which floor does each person live on? 2) Which people can, must, or cannot live on the same floor? Another issue lurks below the surface and will help us to resolve the major key issues listed above, namely: How many apartments are on each floor? Think about this for now—we’ll come back to it in our discussion of Key Deductions. 1) So J must live on one of the floors with two apartments. How you symbolize this is up to you, but make sure that it’s not misleading. “J __” is a good way to keep this rule in mind. 3) The second floor has only one apartment. Build this rule directly into the master sketch. 4) M and N must live on the same floor. Wherever you have one, the other will be there as well. “Always MN” is one way to symbolize this. 5) is the flip side of Rule 4. O and Q will never be on the same floor. “Never OQ” should do it as a visual reminder. 6) Don’t be so quick to symbolize any rule; think about it first. L must be alone on a floor, and the floor that L is on must have only one apartment. Add this information to your sketch. 7) Q doesn’t live on the first or second floors, meaning that Q does live on floor 3, 4, or 5. Build this directly into the sketch. We alluded above to an important sub-issue regarding the number of apartments on each floor. This is key: With eight residents, eight apartments, and a maximum of two residents per floor, it follows that this building must have three floors with exactly two tenants each, and two floors with exactly one tenant each. Check it out for yourself if you need confirmation. Moreover, we know two of our three resident pairs: M/N (Rule 4) and J plus someone (Rule 1). Knowing all this in advance should at least help you get a handle on ordering the entities. What else? Right from Rule 2 we can deduce that K can’t live on the first floor and P can’t live on the fifth floor (the latter of which gets the point for Q. 7). What else? Well, we know a lot about floor 2, so let’s look into that a little further: Floor 2 has only one apartment (Rule 3), so you can deduce that M and N, who live together on the same floor (Rule 4), can’t occupy the second floor (thank you, Question 6). J, who must live on a floor with two apartments (Rule 1) can’t occupy the second floor, either. That makes three entities who cannot live on the second floor—four, when you remember indented Rule 7. And be sure and take the extra step to turn this negative information to the positive: K, L, O, and P are the only possibilities for floor 2. Remember, too, that we have only two “solo” residents: L, and one other. Everyone else lives on a floor with someone else. And notice: L could occupy that one-resident floor 2, but need not. Off to a fast start: We deduced above that the M/N pair can’t live on the second floor, so (D) is the answer. How did we deduce this? Simply by combining Rules 3 and 4: M and N are together, but 2 is a solo floor. Our master sketch confirms that the only entities that can live on floor 2 are K, L, O, and P.
What CANNOT be true? We deduced a whole bunch of things that fit this description, most notably regarding floor 2: J, M, N, and Q can’t live there. Scan the choices . . . no luck. Well, we also deduced from Rule 2 that K can’t live on the first floor and P can’t live on the fifth floor. The latter is cited in correct choice (E). (A) Can O live on the first floor? You bet. 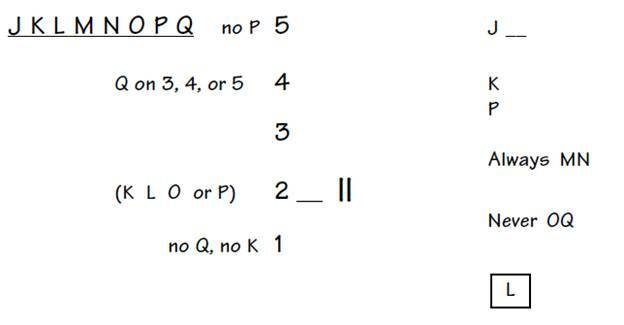 Here would be the ordering: 5—K Q; 4—J P; 3—M N; 2—L; 1—O. Since answer choice (A) can be true, it’s the right answer; as quickly asthat. (B) and (D) As noted above, in this question J and P are the only residents on the fourth floor. (C) Nope, N must live on either the first or third floor. (E) Nope, P must live on the fourth floor. O lives alone on the second floor. Jot that down, but we can’t deduce much from this, so we’ll probably have to check each choice. Since we’re looking for the choice that cannot be true—that is impossible—we can eliminate a choice by finding an instance in which its given conditions work. (A) Can K live on the fourth floor with O on the second? 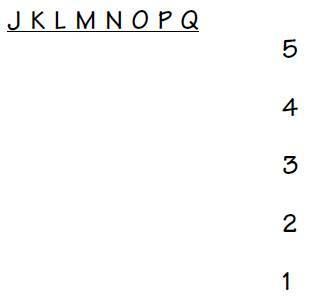 Sure, here’s the ordering: 5—M N; 4—J K; 3—P Q; 2—O; 1—L. (B) Can K live on the fifth floor with O on the second? Sure: 5—J K; 4—P Q; 3—M N; 2—O; 1—L. (C) Can L live on the first floor with O on the second? Sure; check the ordering under either (A) or (B). (D) Can L live on the third floor with O on the second? Sure, here’s the ordering: 5—J K; 4—P Q; 3—L; 2—O; 1—M N.
(E) is all that’s left and must therefore be the answer. For the record, why can’t L live on the fourth floor with O on the second? Because if L is alone on the fourth (L is always alone no matter where she lives) and O is alone on the second, we no longer have two consecutive floors for K and P to occupy (Rule 2). (E) is the answer. Since M lives on the fourth floor, so must N. What next? Look at K and P, the other “bloc” we know about. With the fourth floor occupied to the max, K and P must take floors 3/2, or 2/1. Either way, one of the K/P pair will occupy the second floor—scan the choices—meaning that L, who lives alone on a floor, cannot live on the second floor as (C) suggests. As noted re: Q. 6 above, a “must be true” with no new information is usually testing a deduction. However, these unusually complex answer choices signal that that’s not the case here. Other than skipping Q. 11 altogether, there’s no alternative to checking each choice, using your previous work to save time whenever possible. (A) If J lives on the fourth floor, can Q live on the fifth? Sure, we saw that when we worked out Q. 8: J on floor 4 and Q on floor 5. (A) is not a true statement. (C) In Q. 10, we placed N on the fourth floor along with M and saw that it was possible to put K on the second. Thus we’ve already seen that (C) need not be true. (E) More use of previous work. In Q. 8 (A), P lived on the fourth floor and M lived on the third. That proves that (E) here need not be true. So O lives on the fourth floor and P on the second, eh? Finally, the same kind of helpful concrete information we got in Q. 8. With P living on floor 2 (alone, thanks to Rule 3), K must live on floor 3 (Rule 2). The fifth and first floors are the only ones unoccupied, so M and N must take one of them while L takes the other. That leaves Q and J to be placed, and O and K (on floors 4 and 3, respectively) are in need of floor-mates; but remember Rule 5, which says that O and Q must split up. O and J will have to share floor 4, leaving K and Q on floor 3. (C) has it right. (A) and (D) are possible only, while (B) and (E) are patently false.